There are numerous studies measuring the benefits of magnets to improve the quality of life. Speaking in general terms, most studies showed 65 to 75 percent of the people studied recognized benefits from magnets. There were a smaller number of people on placebos that also recognized benefits. And in general about 25 percent of the people could not recognize any benefits. However there are cases where people could not recognize the benefits until they were off the study for a week and immediately purchased magnetic jewelry to regain the benefits of magnetic therapy. The benefits are subtle and every one has a different pain level. We suspect in many cases people don't recognize the benefits because they are expecting more immediate and dramatic results. However we recognize that some people do not benefit from magnetic therapy. Following are some summaries of the many studies observed. The U.S. Food and Drug Administration today allowed marketing of the Cerena Transcranial Magnetic Stimulator (TMS), the first device to relieve pain caused by migraine headaches that are preceded by an aura: a visual, sensory or motor disturbance immediately preceding the onset of a migraine attack. Migraine headaches are characterized by intense pulsing or throbbing pain in one area of the head accompanied by nausea and/or vomiting and sensitivity to light and sound. A migraine can last anywhere between four and 72 hours when untreated. These debilitating headaches affect approximately 10 percent of people worldwide and are three times more common in women than in men. About one third of people with migraines experience an aura. “Millions of people suffer from migraines and this new device represents a new treatment option for some patients,” said Christy Foreman, director of the Office of Device Evaluation in the FDA’s Center for Devices and Radiological Health. 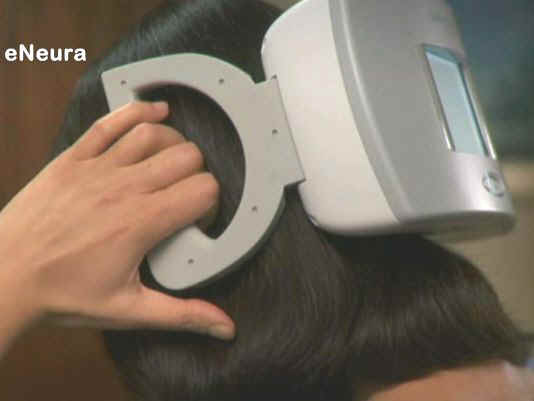 The Cerena TMS is a prescription device used after the onset of pain associated with migraine headaches preceded by an aura. Using both hands to hold the device against the back of the head, the user presses a button to release a pulse of magnetic energy to stimulate the occipital cortex in the brain, which may stop or lessen the pain associated with migraine headaches preceded by an aura. The FDA reviewed the data for the Cerena TMS through the de novo premarket review pathway, a regulatory pathway for some low- to moderate-risk medical devices that are not substantially equivalent to an already legally marketed device. The FDA reviewed a randomized control clinical trial of 201 patients who had mostly moderate to strong migraine headaches and who had auras preceding at least 30 percent of their migraines. Of the study subjects, 113 recorded treating a migraine at least once when pain was present. Analysis of these 113 subjects was used to support marketing authorization of the Cerena TMS for the acute treatment of pain associated with migraine headache with aura. The study showed that nearly 38 percent of subjects who used the Cerena TMS when they had migraine pain were pain-free two hours after using the device compared to about 17 percent of patients in the control group. After 24 hours, nearly 34 percent of the Cerena TMS users were pain-free compared to 10 percent in the control group. The study did not show that the Cerena TMS is effective in relieving the associated symptoms of migraine, such as sensitivity to light, sensitivity to sound, and nausea. The device is for use in people 18 years of age and older. The study did not evaluate the device’s performance when treating types of headaches other than migraine headaches preceded by an aura. Adverse events reported during the study were rare for both the device and the control groups but included single reports of sinusitis, aphasia (inability to speak or understand language) and vertigo (sensation of spinning). Dizziness may be associated with the use of the device. Patients must not use the Cerena TMS device if they have metals in the head, neck, or upper body that are attracted by a magnet, or if they have an active implanted medical device such as a pacemaker or deep brain stimulator. The Cerena TMS device should not be used in patients with suspected or diagnosed epilepsy or a personal or family history of seizures. The recommended daily usage of the device is not to exceed one treatment in 24 hours. WASHINGTON – The government has approved the first noninvasive brain stimulator to treat depression — a device that beams magnetic pulses through the skull. If it sounds like science-fiction, well, those woodpecker-like pulses trigger small electrical charges that spark brain cells to fire. Yet it doesn't cause the risks of surgically implanted electrodes or the treatment of last resort, shock therapy. Called transcranial magnetic stimulation or TMS, this gentler approach isn't for everyone. The Food and Drug Administration approved Neuronetics Inc.'s NeuroStar therapy specifically for patients who had no relief from their first antidepressant, offering them a different option than trying pill after pill. "We're opening up a whole new area of medicine," says Dr. Mark George of the Medical University of South Carolina in Charleston, who helped pioneer use of TMS in depression. "There's a whole field now that's moving forward of noninvasive electrical stimulation of the brain." While there's a big need for innovative approaches — at least one in five depression patients is treatment-resistant — the question is just how much benefit TMS offers. The FDA cleared the prescription-only NeuroStar based on data that found patients did modestly better when treated with TMS than when they unknowingly received a sham treatment that mimicked the magnet. It was a study fraught with statistical questions that concerned the agency's own scientific advisers. For a more clear answer, the National Institutes of Health has an independent study under way now that tracks 260 patients and may have initial results as early as next year. Quantifying the benefit is key, considering the price tag. TMS is expected to cost $6,000 to $10,000, depending on how many treatments a patient needs, says Dr. Philip Janicak of Rush University Medical Center in Chicago, who helped lead the NeuroStar study. That's far more expensive than medication yet thousands of dollars cheaper than invasive depression devices. Neuroscientists have been using TMS for years as a research tool in brain studies. Zap a powerful magnet over a certain spot on the head — where motion is controlled — and someone's arm can suddenly, involuntarily, lash out. 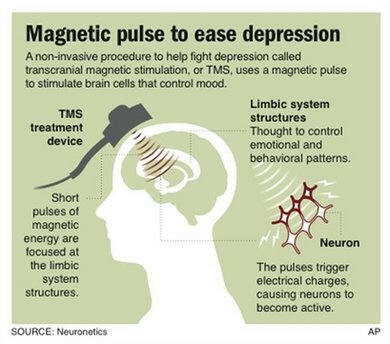 Beyond the "wow" factor, magnetized pulses were triggering brain activity. The question was how to harness that activity in a way that might improve disease. TMS also is being studied in stroke rehabilitation and other brain disorders. "Nobody thought this would work; it was a crazy idea. I had to do it at 6 in the morning before the real scientists came in," South Carolina's George laughs as he recalls work he began in 1993. But, "the brain is an electrical organ," George adds, explaining the rationale. "Electricity is the currency of the brain. It's how the brain does what it does." For depression, psychiatrists aim the magnet at the left front of the head, the prefrontal cortex. Since everyone's brain is different, they first zap the top of the head to find a patient's motor-control region, and then carefully move 5 centimeters forward. Then, the NeuroStar beams about 3,000 pulses a minute during a 40-minute treatment, done about five times a week for up to six weeks. The theory: Stimulating brain cells in the prefrontal cortex triggers a chain reaction that also stimulates deeper brain regions involved with mood. TMS did prove to be very safe: Patients in the NeuroStar study suffered no seizures or memory problems like shock therapy can cause, or other reactions throughout the body. The chief complaint from the sessions was headaches. The FDA cleared the device after focusing just on a subset of the patients initially enrolled — 164 who had failed one antidepressant during their current bout of depression, not those who were more severely treatment-resistant. What's a modest benefit? About 24 percent who got TMS scored significantly better on standard depression measures after six weeks, compared with 12 percent who got the sham, says Janicak. That's about as well as patients respond to a single antidepressant, he says. "One day it was like a light switch went off," says Steve Newman, 60, of Washington, D.C., who enrolled in the NeuroStar study at the University of Pennsylvania in 2005. Newman had suffered repeated bouts of depression since he was a teenager, and drug after drug barely blunted it. He was considering shock therapy when he heard about TMS. After two weeks of treatment, Newman was wondering if he was getting the sham — when suddenly, he started feeling lots better, and doctors spotted a corresponding major improvement in his depression measurements. "I was awake. I was there," says Newman who said he still gets what he calls a "maintenance dose" of TMS about once a month. PARIS (AFP) – Tiny magnetic discs just a millionth of a metre in diameter could be used to used to kill cancer cells, according to a study published on Sunday. Laboratory tests found the so-called "nanodiscs", around 60 billionths of a metre thick, could be used to disrupt the membranes of cancer cells, causing them to self-destruct. Efficacy of static magnetic field therapy in chronic pelvic pain: a double-blind pilot study. Brown CS, Ling FW, Wan JY, Pilla AA. OBJECTIVE: The aim of the study was to determine the efficacy of static magnetic field therapy for the treatment of chronic pelvic pain (CPP) by measuring changes in pain relief and disability. STUDY DESIGN: Thirty-two patients with CPP completed 2 weeks and 19 patients completed 4 weeks of randomized double-blind placebo-controlled treatment at a gynecology clinic. Active (500 G) or placebo magnets were applied to abdominal trigger points for 24 hour per day. The McGill Pain Questionnaire, Pain Disability Index, and Clinical Global Impressions Scale were outcome measures. RESULTS: Patients receiving active magnets who completed 4 weeks of double-blind treatment had significantly lower Pain Disability Index (P <.05), Clinical Global Impressions-Severity (P <.05), and Clinical Global Impressions-Improvement (P <.01) scores than those receiving placebo magnets, but were more likely to correctly identify their treatment (P <.05). CONCLUSION: SMF therapy significantly improves disability and may reduce pain when active magnets are worn continuously for 4 weeks in patients with CPP, but blinding efficacy is compromised. The use of magnetotherapy in diseases of the musculoskeletal system. Bratisl Lek Listy. 1999 Dec;100(12):678-81. Effect of static magnetic fields on bacteria: Streptococcus mutans, Staphylococcus aureus, and Escherichia coli. Kohno M, Yamazaki M, Kimura I I, Wada M.
Biological effect of static magnetic field was investigated by using ferrite magnets to conduct a magnetic field exposure experiment on three species of bacteria: Streptococcus mutans, Staphylococcus aureus, and Escherichia coli. The effects were evaluated by culturing the bacteria and determining their growth rate, the maximum numbers of bacteria, and [3H]-thymidine incorporation. The results showed that the ferrite magnet caused strength-dependent decreases in the growth rate and growth maximum number of bacteria for S. mutans and S. aureus when cultured under anaerobic conditions, but that their growth was not inhibited under aerobic conditions. In addition, [3H]-thymidine was added after culturing each of the species of bacteria for 18 h. After that, culture was continued until 24 h, and changes in [3H]-thymidine incorporation were investigated. But no effect of the magnetic fields was detected. These findings suggested that oxygen related to growth the cases of S. mutans, S. aureus. However, no growth effects were detected on E. coli cultures. Effect of magnetic fields on human and rodent cancer cell survival. Tata, D., Vanhoutten, N., Brook, C., &TrItton T.
In a laboratory study, several rodent and human cancer cell types were exposed to permanent magnetic fields for one hour to determine what percent of the cells would survive compared to unexposed cells. The permanent magnetic field was extremely strong (11.6 Tesla = 116,000 gauss) and was generated by sophisticated equipment. Some of the surviving cell fractions included 25% for human breast carcinoma, 40% for human ovarian carcinoma, and 4% for human mouth carcinoma. Non-Invasive permanent magnetic field modality induces lethal effects on several rodent and human cancers. In Vitro. Proceedings of the American Association for Cancer Research, 1994; 35, 386. Static magnetic field influence on rat brain function detected by heart rate monitoring. Veliks V, Ceihnere E, Svikis I, Aivars J. Faculty of Biology, University of Latvia, Riga, Latvia. The aim of the present study was to identify the effects of a static magnetic field (SMF) on rat brain structures that control autonomic functions, specifically heart rate and heart rhythmicity. The experiments were carried out on 44 male Wistar rats under ketamine-xylazine anesthesia. SMF was induced using samarium-cobalt fused magnets (20 x 20 x 10 mm in size) placed bitemporally. Magnetic induction intensity was 100 mT on the surface of the head. Duration of magnetic field application was 15 min. An electrocardiogram was recorded from limb lead II, and both heart rate (average duration of cardiac cycles) and heart rhythmicity were analyzed before and after SMF application. SMF evoked changes in both heart rate and rhythm in 80% of the animals; the predominant effects were bradycardia and disappearance of respiratory sinus arrhythmia. However, the effectiveness of SMF in large measure depends on both functional peculiarities and functional activities of brain autonomic centers. Bioelectromagnetics 25:211-215, 2004. Copyright 2004 Wiley-Liss, Inc.
Biochemical study of human periodontal ligament: preparation of cell attachment materials induced by pulsed electromagnetic fields. Department of Oral Biochemistry, Kanagawa Dental College, Japan. The periodontium, especially the periodontal ligament and alveolar bone, are tissues constantly subjected to physical stress such as occlusion and mastication. This study was designed to explore the effect of the pulsed electromagnetic fields (PEMF) on the cell attachment and the spread of human periodontal ligament fibroblasts (HPLF) and rat osteoblasts (ROB). PEMF are categorized as one type of mechanical stress. HPLF were obtained by the explantation method described by Saito et al. They were then subcultured in Dulbecco's modified Eagle's medium (D-MEM) and supplemented with 2 mg/ml dialyzed fetal calf serum protein (FCSP), 50 micrograms/ml ascorbic acid and penicillin/streptomycin after trypsinization. ROB were isolated from a two-day-old rat calvaria by the sequential bacterial collagenase digestion method described by Dziak and Brand and were subcultured in D-MEM supplemented with FCSP, ascorbic acid and penicillin/streptomycin. After the confluent HPLF were cultured with serum-free MCDB 107 medium, the quiescent HPLF were exposed with or without PEMF for 24 hr. This was followed by the collection of the control conditioned medium (C-CM) and PEMF exposed conditioned medium (PEMF-CM). The cell attachment assay was performed so that the hydrophobic 24 multiwells were coated with the whole conditioned medium or fractionated conditioned medium by a PO-60K column. After coating, heat inactivated BSA blocked nonspecific sites for cell adhesion, and 3H-TdR labeled HPLF or ROB were cultured on the precoated wells. The activity of cell attachment and spreading was determined by the radioactivity of 3H-TdR using a scintillation counter. The characters of cell attachment factors derived from HPLF were hydrophobic, heat labile and proteolytic enzyme digestible. In addition, the fractionated PEMF-CM enhanced the spreading activity of ROB. PEMF induced the 10 KDa which can enhance the HPLF and ROB spreading. Therefore, the cell attachment and spreading factors secreted by human periodontal ligament fibroblasts exposed with pulsed electromagnetic fields may regulate human periodontal ligament fibroblasts and also rat osteoblasts. Clinical effectiveness of magnetic field therapy--a review of the literature. Quittan M, Schuhfried O, Wiesinger GF, Fialka-Moser V.
To verify the efficacy of electromagnetic fields on various diseases we conducted a computer-assisted search of the pertinent literature. The search was performed with the aid of the Medline and Embase database (1966-1998) and reference lists. Clinical trials with at least one control group were selected. The selection criteria were met by 31 clinical studies. 20 trials were designed double-blind, randomised and placebo-controlled. The studies were categorised by indications. Electromagnetic fields were applied to promote bone-healing, to treat osteoarthritis and inflammatory diseases of the musculoskeletal system, to alleviate pain, to enhance healing of ulcers and to reduce spasticity. The action on bone healing and pain alleviation of electromagnetic fields was confirmed in most of the trials. In the treatment of other disorders the results are contradictory. Application times varied between 15 minutes and 24 hours per day for three weeks up to eighteen months. There seems to be a relationship between longer daily application time and positive effects particular in bone-healing. Patients were treated with electromagnetic fields of 2 to 100 G (0.2 mT to 10 mT) with a frequency between 12 and 100 Hz. Optimal dosimetry for therapy with electromagnetic fields is yet not established. Extracorporeal magnetic stimulation for the treatment of stress and urge incontinence in women--results of 1-year follow-up. Unsal A, Saglam R, Cimentepe E.
OBJECTIVE: To evaluate the clinical efficacy of extracorporeal magnetic stimulation for the treatment of stress and urge urinary incontinence in women. MATERIAL AND METHODS: A total of 35 patients with stress incontinence and 17 with urge incontinence were enrolled in this study. All patients were evaluated by means of a detailed history of incontinence, a gynecologic examination, urine culture, urinary system ultrasound and a urodynamic study. All patients were asked to keep a 3-day voiding diary. A pad-weighing test was done for each patient at their first visit. For treatment, the patients were seated on a special chair containing a magnetic field generator. Pelvic floor muscle stimulation was performed for 20 min (10 min at 5 Hz and 10 min at 50 Hz) twice a week for a total of 8 weeks. The mean follow-up period was 16.8 months (range 12-32 months). A total of 44 patients completed 1 year of follow-up and were re-evaluated by means of voiding diary, pad-weighing test and cystometric study. RESULTS: Of the 44 patients, 11 (38%) with stress incontinence and 6 (40%) with urge incontinence were cured 1 year after the treatment. In addition, there was an improvement in symptoms in 12 patients (41%) in the stress group and 7 (47%) in the urge group. Pad weight was reduced from 15.4 to 5.8 g in the stress group and from 12.4 to 4.7 g in the urge group (p = 0.000 and 0.001, respectively). Mean Valsalva leak point pressure was increased from 87.3 +/- 15.9 to 118.0 +/- 11.0 cmH (2) O in the stress group (p = 0.000). CONCLUSIONS: Extracorporeal magnetic stimulation therapy offers a non-invasive, effective and painless treatment for stress and urge incontinence in women. Treatment of migraine with pulsing electromagnetic fields: a double-blind, placebo-controlled study. Sherman RA, Acosta NM, Robson L.
Orthopedic Surgery Service, Madigan Army Medical Center, Tacoma, WA 98431, USA. The effect of exposure to pulsing electromagnetic fields on migraine activity was evaluated by having 42 subjects (34 women and 8 men), who met the International Headache Society's criteria for migraine, participate in a double-blind, placebo-controlled study. Each subject kept a 1-month, pretreatment, baseline log of headache activity prior to being randomized to having either actual or placebo pulsing electromagnetic fields applied to their inner thighs for 1 hour per day, 5 days per week, for 2 weeks. After exposure, all subjects kept the log for at least 1 follow-up month. During the first month of follow-up, 73% of those receiving actual exposure reported decreased headaches (45% good decrease, 14% excellent decrease) compared to half of those receiving the placebo (15% worse, 20% good, 0% excellent). Ten of the 22 subjects who had actual exposure received 2 additional weeks of actual exposure after their initial 1-month follow-up. All showed decreased headache activity (50% good, 38% excellent). Thirteen subjects from the actual exposure group elected not to receive additional exposure. Twelve of them showed decreased headache activity by the second month (29% good, 43% excellent). Eight of the subjects in the placebo group elected to receive 2 weeks of actual exposure after the initial 1-month follow-up with 75% showing decreased headache activity (38% good, 38% excellent). In conclusion, exposure of the inner thighs to pulsing electromagnetic fields for at least 3 weeks is an effective, short-term intervention for migraine, but not tension headaches. Weak electromagnetic fields attenuate tremor in multiple sclerosis. NeuroCommunication Research Laboratories, Danbury, CT 06811, USA. It has been estimated that about 75% of patients diagnosed with multiple sclerosis (MS) have tremor which can be exceedingly disabling. The most common tremor observed in patients with MS is a cerebellar intention tremor ('kinetic tremor') although postural tremor ('static tremor') is also common and often extremely incapacitating. Currently there is no effective medical treatment for the tremor of MS which, in some severe cases, may be abolished by stereotactic thalamotomy. It was reported recently that extracranial application of brief AC pulsed electromagnetic fields (EMFs) in the picotesla (pT) range produced improvement in motor and cognitive functions in patients with MS. The present communication concerns three MS patients with a chronic progressive course of the disease (mean age: 39.3 +/- 8.3 years; mean duration of illness: 11.3 +/- 3.2 years) in whom brief external applications of pulsed EMFs of 7.5 pT intensity reduced intention and postural tremors resulting in significant functional improvement. The report suggests that these extremely low intensity electromagnetic fields are beneficial also in the treatment of tremors in MS and that this treatment may serve as an alternative method to stereotactic thalamotomy in the management of tremor in MS. The mechanisms by which EMFs attenuate the tremors of MS are complex and are thought to involve augmentation of GABA and serotonin (5-HT) neurotransmission in the cerebellum and its outflow tracts. Int J Neurosci. 1994 Dec;79(3-4):199-212. The effect of pulsed electromagnetic fields on osteoporosis at the knee in individuals with spinal cord injury. Garland DE, Adkins RH, Matsuno NN, Stewart CA. Rancho Los Amigos Medical Center, Downey, California 90242, USA. J Spinal Cord Med. 1999 Winter;22(4):239-45. A drug naive parkinsonian patient successfully treated with weak electromagnetic fields. Brief cerebral application of picotesla (pT) electromagnetic fields (EMF) has been demonstrated an efficacious, revolutionary treatment modality for the therapy of Parkinson's disease (PD) with clinical benefits being evident in all motor aspects of the disease as well as in nonmotor symptoms such as mood, sleep, pain, sexual dysfunction, autonomic regulation and cognitive functions. Since treatment with pT EMF has involved PD patients who were treated with dopaminergic agents at the time they received EMF there may have been a synergistic interaction between dopaminergic drugs and EMF. The present communication concerns a 49-year-old male Parkinsonian patient with stage 3 disability on the Hoehn and Yahr scale (1967) who, in response to brief extracranial applications of pT EMF, demonstrated a marked improvement in motor, depressive symptomatology and cognitive functions and was classified as stage 1 several weeks later. This case is remarkable in that the patient did not receive treatment with dopaminergic drugs prior to or during the course of EMF therapy. It suggests that (a) pT range EMF may be efficacious as a monotherapy for PD and should be considered also as a treatment modality for de novo diagnosed patients, and (b) application of these EMF improves Parkinsonism by a mechanism which involves, among others, augmentation of dopaminergic and serotonergic neurotransmission. Int J Neurosci. 1994 Nov;79(1-2):99-110.